He was born in Kyoto. His boyhood name was "Shoo Maru" 正丸. His haiku names are 自遣堂・応々山人・休々山人. 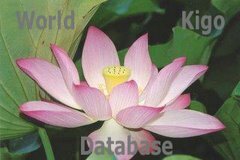 He was a monk of the Pure Land Sect and also a famous haiku poet. His father Takunyo 琢如（たくにょ) had been priest at the famous temple Higashi Honganji in Kyoto. He lived at the temple Zuisenji 越中国井波瑞泉寺, where he became abbot in 1677 at the tender age of 7. He often travelled to Kyoto to meet his father and his brother, both haiku students of Kitamura Kigin. Later he became a haiku student of Mukai Kyorai, one of the 10 important disciples of Basho. In 1694 he met Matsuo Basho for the first time at the Haiku Group in Saga/Kyoto, Rakushi sha 落柿舎（らくししゃ）and became his disciple. He was very fond of Basho and built a memorial for him after the death of Basho. He received a bit of the hair of Basho as mememto and later build his recluse, "Black Hair Hermitage" Kurokami An 黒髪庵. The Pilgrimage to Kyoto with its many shrines, temples and the Emperor's palace was among the three famous pilgrimages during the Edo period, 庶民の三大行事. "Thanks pilgrimages" or "blessing pilgrimages," a term referring to periodic mass pilgrimages to the Grand Shrines of Ise (Ise Jingū) in the Edo period, undertaken against the backdrop of the spread of the Ise cult (Ise shinkō) from the middle ages and the general acceptance of pilgrimages by commoners to the shrines at Ise. This kind of mass pilgrimage phenomenon is believed to have been observed some fifteen times through the early modern period, including the years 1638, 1650, 1661, 1701, 1705, 1718, 1723, 1730, 1748, 1755, 1771, 1803, 1830, 1855, and 1867. Of these, the four in 1650, 1705, 1771, and 1830 have traditionally been considered of the largest scale, with over two-million pilgrims participating in 1771. Another characteristic of these pilgrimages is the consciousness that they were to occur every fifty to sixty years, in rough conjunction with the sexegenary cycle. The term okagemairi is said to have become commonly used from around the time of the 1771 event, and while the expression nukemairi ("slipping away pilgrimage," one taken without permission) is also used, the two terms were normally discriminated based on their different motifs. In 1867, the pilgrimage tended to be more local in nature, and it tended on the whole to have the characteristics of a mass movement during a period of social revolution, in which "world-renewal dances" gained popularity in conjunction with the concurrent fad of the so-called eejanaika movement (an antinomian folk movement with millenarian overtones). In sum, each occasion of the okagemairi tended to feature its own unique motifs. The significance of the term okage is not clear, but it appears to have referred either to the "blessings of the Grand Shrines," or to the fact that the pilgrimage was possible due to the "blessings of others," (namely, money and other alms given to pilgrims along the way). Daidai kagura was performed at Ise shrine.
. O-Kage Mairi Dolls . MAIRI 参り　is usually a pilgrimage to a famous Shinto shrine. Since free travel of commoners was not allowed during the Edo period, a pilgrimage was usually a good excuse to get away. Issa is referring to the great Shinto shrine at Ise. As part of a winter exorcism ritual, a priest is driving away evil spirits--from a horse.
. Pilgrimages in Japan - Introduction . Takama Yoshihide 議秀（よしひで）was his real name. Born in Fukushima prefecture. He graduated from Waseda University Department of English Literature. He worked as an English teacher at junior high school. Akutagawa Literary Award winning writer. After the war, he began to write historical novels about samurai life. On the day before his death he was baptised a Christian. After his death, a literature prize was established in his name. His grave is at the temple EngakujiTemple (円覚寺), Shoreiin (松嶺院) in Kita-Kamakura. Temple Ishiyamadera - "Stone Mountain Temple"
This festival originated after WWII, in the "Hotarudani" 蛍谷 of the temple compound, in memory of the famous priest of the Heian period, Roochoo ritsushi 朗澄律師. 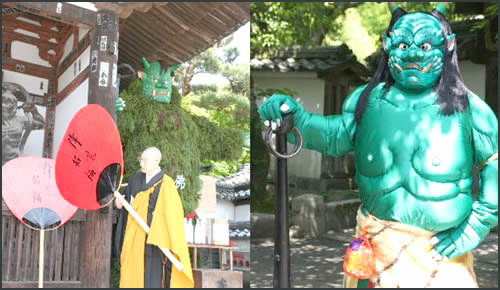 A demon figure, five meter tall and made of green cedar branches, is displayed at the main gate of temple Ishiyamadera. This represents the figure of Roochoo, who had promised to protect the Buddhist law from the disturbances of the Green Demon. Literally "Temple at Rocky Mountain"
"Stony Mountain Temple" is a Shingon temple in Ōtsu in Japan's Shiga Prefecture. This temple is the thirteenth of the Kansai Kannon Pilgrimage. It was constructed around 762 CE, and is said to have been founded by Rōben. The temple contains a number of cultural assets. According to literature available at the temple complex, the guardian carvings at Sanmon/Todaimon are by Tankei and Unkei. Allegedly, Murasaki Shikibu began writing The Tale of Genji at Ishiyama-dera during a full moon night in August 1004. In commemoration, the temple maintains a Genji room featuring a life-size figure of Lady Murasaki and displays a statue in her honor. Set on the side of a mountain overlooking Lake Biwa, Ishiyama-dera temple was a popular pilgrimage in Murasaki's day. It was founded in 749 and is headquarters of one of the Shingon Buddhist sects. The temple is mentioned in the Ukifune chapter of The Tale of Genji and is the 13th temple of the Saigoku Kannon pilgrimage. Murasaki is said to have begun writing The Tale of Genji at Ishiyamadera Temple on the night of the full moon, August 1004. To commemorate this event, the temple maintains a Genji Room with a life-size figure of the author at work. The temple's tahoto (treasure tower) was built by Minamoto Yoritomo in the Kamakura period, and is the oldest of its type in Japan. Ishiyama-dera is particularly beautiful during the cherry-blossom season. The temple's buildings and gardens are spread out over the mountain side. The famous rocks, which give the name to this "Stone Mountain Temple", are made from Wollastonite, keikaiseki 硅灰石. 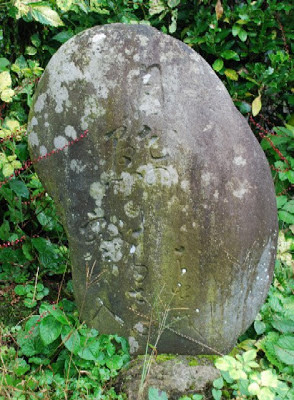 ISHI might be translated as stone, rock. More LINKS about this temple. These specially prepared dry sugar sweets (higashi 干菓子) in the form of chrysanthemums, peonies, plum blossoms and other seasonal flowers and auspicious animals like cranes, , which change each spring and autumn. The special shop which prepares them since the Edo period uses wooden molds more than 200 years old. The colors are mostly pink, white, yellow, green and blue. "Hailstones: Hard things hitting hard things in a hard place. 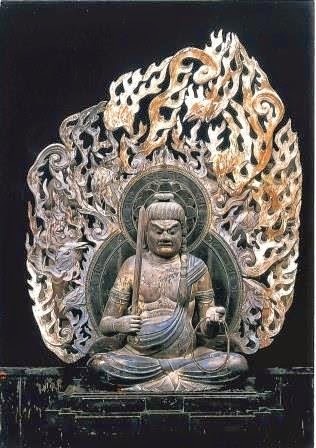 Mountain passes were mysterious places in old Japanese culture, inhabited by boundary gods and placatory shrines, sometimes with the carved figure of a man and a woman coupling." Barnhill's literal translation of "tabashiru" is: "shower-down." Ishiyama, literally, means "Stone Mountain". this time from another area of Japan. Read a discussion of this haiku !
. Lunar Months and the Saijiki . Nowadays it corresponds to the first of September in its climate, and thus has become a kigo for mid-autumn. From this day on, strong typhoons are hitting Japan and farmers begin fearing for their harvest (and livelyhood).
. nihyaku tooka 二百十日の風祭り wind festival on the 210th day . In the rural Japan of old, the ceremonies at the seasonal changes were very important for strengthening the bonds with the gods and among the farmers. In the old lunar calender, the very first day of a month, when there was no moon, is called SAKU　朔 or tsuitachi. The first day of the eighths month is hachigatsu sakuhi 八月朔日, shortened to HASSAKU. Ceremonies held on this day are also called like this. They have an old tradition in rural Japan to honour the rice paddies, which are just about beginning to bear fruit. Farmers bring the best fruit of their harvest to the landowner to celebrate and wish for a good harvest coming autumn. TA NO MO is a play with words of an invocation to the gods for a good harvest "tanomimasu". hassaku ningyoo　八朔人形 to their masters in an act of gratefulness. Grandparents would make a straw horse for a baby boy who was born in the past year. 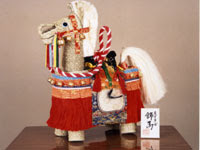 Nowadays many splendid horses are for sale.
. . . CLICK here for Photos of Hassaku dolls !
. 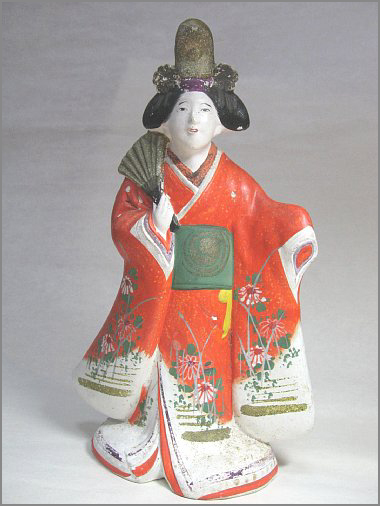 Hassaku Dolls 八朔人形 from Sano town, Tochigi . hassaku Hina dolls from Iki Island .
. hassakubina, hassaku hina 八朔雛 . This rural custom may have spread to the nobility and townsfolk in the Edo period. It then became the custom to bring small presents to those who are close to you in your work. They also ate and served each other sweet Hassaku Mochi 八朔餅　dumplings in the knowledge that from now on the autumn harvest with a lot of extra hard and long work would come for most ... and maybe the taste of the mochi was a bit bitter in this expectation.
. . . CLICK here for Photos of the dumplings! Bokai were special vessels for carrying food around. Small white melons are painted with a powdered white face, cloths are draped around bamboo sticks to make them look like little princesses. This is a custom still practices in Kyoto. ..... for men the black official kimono with the family crest. Since it is still rather hot on this day, men sweat a lot during the ceremonies. Even the ladies of the Yoshiwara quarters would wear light, often white robes or large white belts and visit their sponsors. Nowadays, Hassaku is celebrated in the Gion quarters of Kyoto, where the maiko walk around in light white kimono. Click HERE for some photos of the girls ! Worn during the Edo period by the officials and regional lords for this festival. The term hassaku refers to the first day of the eight lunar month and the term hassaku matsuri encompasses a variety of observances held to ask the gods (kami) for a plentiful harvest. The hassaku matsuri at Matsu-no-o Shrine (Matsunoo Taisha) in Nishikyō Ward, Kyoto City, Kyoto Prefecture is held on the first Sunday of September-which is actually numerically one month later than the traditional first day of the eight lunar month. The Tanomi shinji (田の実) held on September 13 at Aguchi Shrine in Sakai City, Osaka Prefecture, is also a hassaku festival, in which local farming households offer the first ears of rice harvested. Likewise, on September 1 Iwakiyama Shrine in Iwaki Town, Naka-Tsugaru County, Aomori Prefecture, and Dewa Sanzan Shrine in Haguro Town, Higashi-Tagawa County, Yamagata Prefecture perform rituals called Tanomosai (田面祭) to secure a bountiful harvest. Moreover, Ono Shrine in Shiojiri City, Nagano Prefecture, holds a similar ritual on hassaku called Tanomosai (田母祭), whereas a Hassaku matsuri is held on hassaku both at Ōhirasan Shrine in Hirai District, Tochigi City, Tochigi Prefecture, and at Ōarai Isozaki Shrine in Ōarai Town, Higashi-Ibaraki County, Ibaraki Prefecture. These and other cases demonstrate the ritualization of the lay custom of offering newly harvested grains to kami on hassaku and "entreating" (tanomu) them for a bountiful harvest. ©　— Mogi Sakae, Kokugakuin University. This festival has a tradition of more than 200 years. Prayers are said to prevent damage from storm and water, for a good harvest, for the safety of the region and for a prosperous family. It starts on August 31 and the main event in on September 1. When Tokugawa Ieyasu entered the castle of Edo in 1590, his retainers and the feudal lords were invited for a congratulating ceremony. Red ceremonial rice (sekihan) was served as food for the townspeople. In memory of this day, the students of a tea ceremony master come to visit him on this day. Roasted ears of the susuki grass were mixed in the rice gruel. It was supposed to have medical properties to keep you fit for the harvest season. These words are also kigo for the season. For the Sen school of tea, there is also a special tea ceremony on this day (and the first of January), when the ten supporting craftsmen (juushoku　十職) of this school are invited to celebrate the bond of their continuous support. The long bonds between the Raku family, making tea cups (rakujawan 楽茶碗) and others are well known. In the creative aspect of the art, it is the iemoto who sanctions new utensils and styles for use within the school and can forbid the use of unrecognized objects and utensils made by unsanctioned craftsmen. Utensils are developed through relationships with established craft families (Senke Jushoku) as well as new artisans whose work meets his standards. Each iemoto establishes his preferences (konomi mono) in utensil types and designs, these then become part of the utensil repertoire available for students. Through authentication (hakogaki), he establishes a sense of taste. Other ways of exerting influence over the utensils used for chado are through officially recognizing certain craftsmen and utensil dealers and encouraging members to patronize these people, by engaging in utensil sales, by assisting museums and other exhibitors in displaying utensils for public viewing, by providing assistance to scholars and researchers of the arts, and through financial support to individuals and institutions which promote the study and practice of chado. By being the authority and definer of chado's symbolic content, the iemoto perpetuates the art through an hereditary system that enables continuity and creativity. Click HERE for photos of this shrine ! Look at some PHOTOS HERE ! A kind of plum that came via China to Japan a long time ago. It flowers arount the first of August, with a specially full blossom (yae 八重) and the flowers might last as long as December. 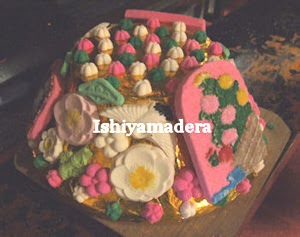 © PHOTO Copyright(C)1995-2006 Echizenya Co.,Ltd. This day relates to the second day of the second month, according to the Asian lunar calendar. If you receive a moxabustion on one of these days, it is supposed to be a hundredfold more powerful for your health. Modern dates may place this custom on the second day of March and September. with a moxa on his shins . . .
there is another SANRI one on the arm. yaitobana 灸花 (やいとばな) "moxa flower"
hekuso kazura 屁糞葛（へくそかずら） "smelling fart vine"
for the tired monks and lay people. With the wish for health in the coming summer. at temple Zuiryu-ji 瑞龍寺 Zuiryuuji.
. - Basho and the Acupuncture needles - . 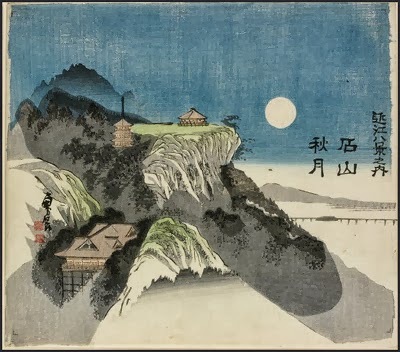 "Possessed by the spirits of roving which wrenched the heart, beckoned by Doosojin, unable to settle hand on anything, I mended a tear in my pants, replaced a cord in my hat, burned my shins with moxa, and then with the moon of Matsushima rising in my mind..."
***** . Mugwort (yomogi) for moxabustion . ***** . PLANTS - - - the Complete SAIJIKI .
. Dates used in Haiku and Kigo . He was a famous Tanka Poet. He was the family doctor of Ryūnosuke Akutagawa and assisted in his suicide. The story of Giō and Hotoke is long and involved, but basically tells of the most famous shirabyoshi Giō, who had won the heart of Taira no Kiyomori, being ousted by a younger and more talented shirabyoshi named Hotoke. Kiyomori cruelly sent Giō away, which grieved her greatly, and Hotoke was constantly ridden with guilt. A year later, Giō was asked to perform a dance for Hotoke at Kiyomori's command, who actually intended on humiliating her. In her grief and humiliation, Giō, her sister and their mother became nuns seeking for a happier life. A few years later, the guilt was too great for Hotoke and she became a nun. She asked for forgiveness from Giō, who willingly forgave her and the four women lived out the rest of their days in prayer. were female dancers that performed traditional Japanese dances (also called "shirabyoshi") dressed as men. The profession of shirabyoshi developed in the 12th century. They would perform for nobles and high-ranking samurai, and at celebrations. They are sometimes referred to as courtesans in the West, but the term refers to a high-class prostitute, so this is rather incorrect. By nature they were performers, though some shirabyoshi would give birth to nobles' children, but this was not their purpose. Shizuka, a famous shirabyooshi, commonly referred to as Shizuka-gozen, was the concubine and lover of Minamoto no Yoshitsune, the tragic hero of many folk legends. And crowd the lily pond to seek his hand."
. Dolls from Shimane 島根県 . Japanese are very fond of pair cups. Usually, they are called "Couple's cups" meoto yunomi 夫婦湯のみ for husband and wife. Now boyfriends and girlfriends use them when they live together. Usually the one for the wife is just a bit smaller. We also have rice bowls for couples in the same way. Click on this thumbnail to view some more samples. 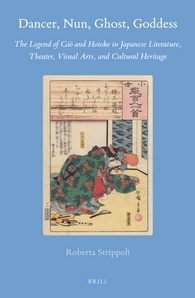 explores the story of the dancers Giō and Hotoke, which first appeared in the fourteenth-century narrative Tale of the Heike. The story of the two love rivals is one of loss, female solidarity, and Buddhist salvation. Since its first appearance, it has inspired a stream of fiction, theatrical plays, and visual art works. These heroines have become the subjects of lavishly illustrated hand scrolls, ghosts on the noh stage, and Buddhist and Shinto goddesses. Physical monuments have been built to honor their memories; they are emblems of local pride and centerpieces of shared identity. Two beloved characters in the Japanese literary imagination, Giō and Hotoke are also models that have instructed generations of women on how to survive in a male-dominated world. ... I translate “Gio dera” to “ladies’ temple” in a stanza by Basho taken from linked verse, known as renga. The Gion Shōja (or Jetavana) temple in India is where the Buddha gave most of his discourses. This passage is usually said to portray the fall of Kiyomori and his clan from power and wealth to exile and death – however the words well apply to the tale of the four dancers who became four nuns. Basho sets up the opposition of storm and bells. The first is wild, violent, uncaring; the second deep, steady, and unifying. The storm represents the arrogance and intimidating behavior of men such as Kiyomori; the bells are the steady, focused energy of women. A bell, shaped like a uterus, is clearly female. 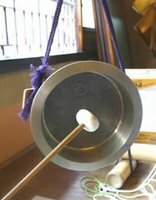 Temple bells, with their reverberations of up to a full minute, are conducive to meditation, and have become a symbol for world peace. “Bells,” as final word of the verse, resounds through the weariness of the daughter as well as the violence of the storm. In “bells” there is resolution. When I visited Gio-ji, I spoke to a priest who pointed out that the temple has no bell, so in Basho’s stanza we hear the bells of many temples in Saga combining their reverberations. While Gio-ji lacks a bell, it does have a beautiful moss garden which you can walk through but not touch. The temple is a twenty minute walk from Arashiyama Station which is a fifteen minute ride on the JR Sagano Line from Kyoto Station. There are statues of the four women, and their graves; they remained together for eternity. Maybe if you are there in the evening, you will be able to hear the kindness of Gio, the wisdom of Lady Buddha, the solidarity of the four women, in the temple bells of Saga. 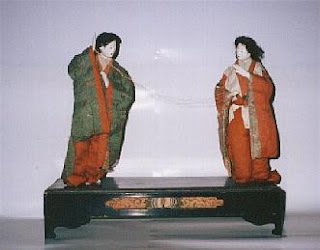 Furthermore, through this renku pair, we can explore the multi-faceted issue of gender politics, the ways men use their power to dominate women, the adaptations of women to survive, the chamberlain’s daughter who seems to be alone in her weariness, the ladies who found happiness in sharing their lives of devotion. ... 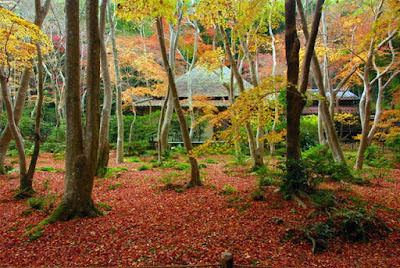 Tiny Gio-ji Temple is one of the most scenic spots in Arashiyama. The thatched-roof main hall overlooking a moss-covered grotto is a magical sight.
. Matsuo Basho Archives 松尾芭蕉 . On the 23rd of March a lantern procession leads from the temple Soofuji-Ji. Its history dates back to about 400 years, it started in 1629. It is a lantern festival of Nagasaki 長崎ランタンフェスティバル. This festival dates back to the Edo period, when the merchants from China were permitted to stay in Nagasaki for trade and business. 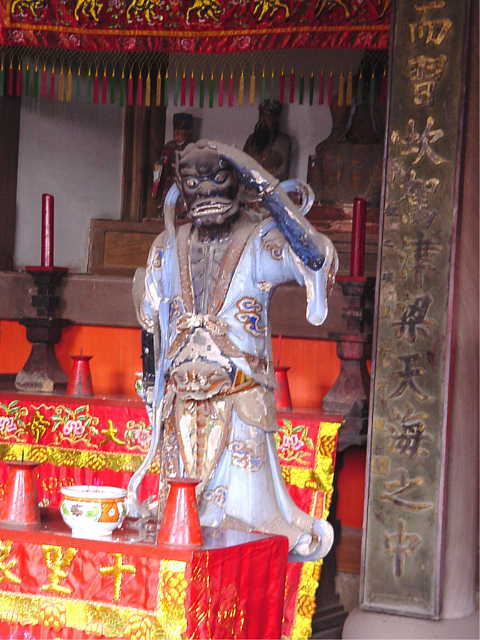 The deity Maso sama 媽祖様 is venerated as a god who brings good luck for travelling ships. This day is thought to be his birthday. A lot of food is presented to the deity, including the head of a pig and a goat. 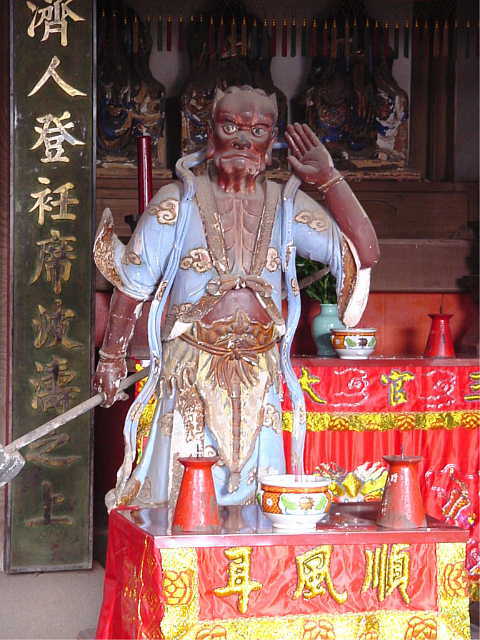 the Chinese protector goddess of the sea, is a syncretic deity who was originally the object of popular worship in Fujian Province in the Song Dynasty (960-1279). Worship of Maso spread throughout China during the Yuan Dynasty (1279-1368), when she was enshrined on ships carrying rice from southern China north to Beijing. During the Ming Dynasty, veneration of Maso spread through international trade to Taiwan, Japan, Korea, and Southeast Asia. Portable shrines to Maso were also kept on Chinese ships that traded with Nagasaki, and were transferred to worship halls in the Chinese temples in Nagasaki while the ships were in port. This ritual transfer was called the "Bosatsu age" ("raising of the bodhisattva"), and provided the occasion for a lively parade and other festivities. The original Maso Hall at Kofukuji was destroyed in the Great Nagasaki Fire of 1663 (Kanbun 3), but is thought to have been rebuilt in 1670 (Kanbun 10). The hall's ceiling is shaped like the inverted hull of a ship, in another reference to the enshrined deity's identity as the protectress of seafarers. Maso is seated in the center of the rear of the hall, and is accompanied by numerous other deities, including the red and blue demons who stand before her. 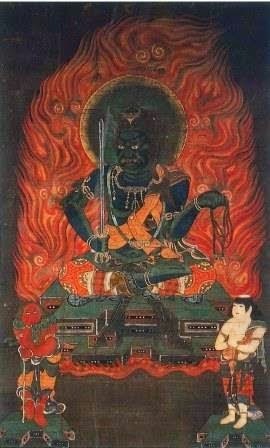 These demons, tamed by Maso, are actually the benevolent beings Senrigan and Junpuji, whose very names--literally "eyes that see a thousand leagues" and "ears that hear through the winds"--convey their powers. The hall was built in a fundamentally Japanese architectural style, painted vermilion on the interior and exterior. Elements of "Obaku-style" architecture grace the structure, however, and are especially evident in the vaulted Obaku ceiling of the front gallery, the half-length doors, and the interior ceiling. This temple Koofuku-Ji is now one of the oldest of the Obaku sect. Look at many more beautiful photos HERE ! chinpunkan pun for more rhythm in the Japanses language. 陳分漢 Chinpun Kan was a common of Chinese merchants, it seems, to be heared in Nagasaki during the Edo period. It was difficult for the Japanese to pronounce, so they made it "gibberish", chinpun kanpun. In China it is also used in this meaning, as chinputon kanputon チンプトン、カンプトン. chinputon was something you did not understand when you heared it spoken, kanputon was something you did not understand when you saw it. Japanese also used it when making fun of the scholars of Confucianism reciting the books in Chinese. Sometimes this is written like this: チンプン漢文. There is also the expression: tonchinkan とんちんかん, but that only reflects the sound of the smiths of old when hammering the iron in a certain rythm. chinpunkan, chinpun kanpun is a play of words with the sound of the prayer gong and the meaning of gibberish, something is all Greek to me, as explained above. Issa has more haiku with this expression. 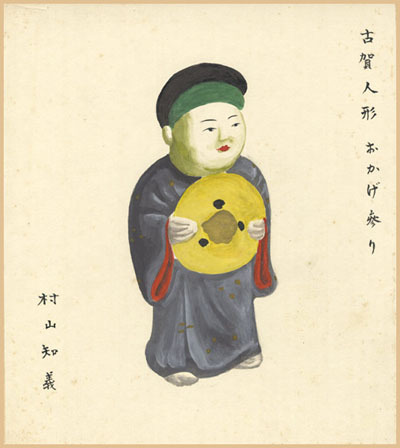 Issa, With a haiga by Nakamura Sakuo. .. ... ... ... ... ..
from tub to tub . .
. tarai 盥 -　たらい　tub, basin, washing bowl, wash tub . The red little berries are used in Chinese Traditional Medicine. Issa spent some time in Nagasaki in 1793, age 31. Here is a haiga by © Nakamura Sakuo.